Representatives from Hong Kong-listed casino investor Landing International Development Ltd met Philippine President Rodrigo Duterte about developing a “theme park integrated resort” in that country. A press release from Landing International – which is also a mainland China real estate developer – made no reference to a potential location for the project, nor whether it would have a casino. Within the gaming industry, “integrated resort” or “IR” is generally a euphemism for a venue offering licensed gambling, hotel accommodation, shops and often convention space. 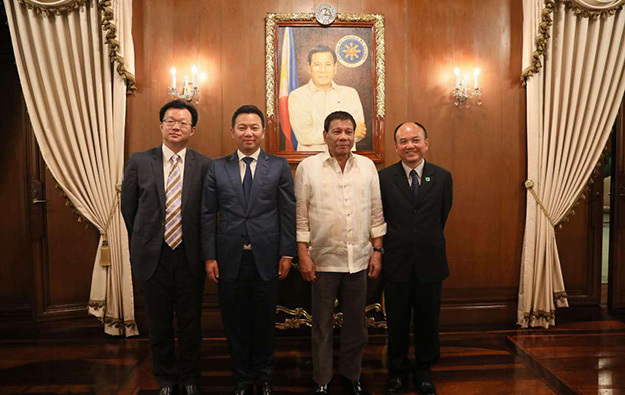 The Monday meeting at the Philippine Presidential Palace was attended by Landing International’s chairman Yang Zhihui (pictured, centre left) and other company senior executives. According to the release from the firm, President Duterte (pictured, centre right) welcomed the company’s inward investment proposal and expressed “his keen interest and overwhelming support”. “Following our first meeting with the President in May 2017 in Hong Kong to discuss investment opportunities in the Philippines, we are honoured to share with President Duterte and his cabinet team our vision for tourism in the country and our proposal to build an iconic international branded theme park integrated resort in the Philippines,” Mr Yang said in a statement included in the release. Mr Yang further stated that the project would “enhance Philippines’ tourism appeal” and “create significant employment opportunities”. A Wednesday report from the Manila Standard newspaper said the project would include gaming and would be in Metro Manila, involving a 147-hectare (1.47-square kilometre) land reclamation scheme in Manila Bay. The head of the Philippines’ gaming regulator, Andrea Domingo, had said in March that the country would have a five-year moratorium on issuing further casino licences for the capital Manila, amid industry concerns of oversupply. Despite the moratorium on more Manila licences, the regulator was said to be welcoming applications for other parts of the country. Landing International already owns and operates a casino on the South Korean holiday island of Jeju. The facility is branded Landing Casino and located at the Hyatt Regency Jeju Hotel. In April 2016, Landing International acquired Les Ambassadeurs Club and Casino, an upmarket gaming venue in London in the United Kingdom. The firm is developing a second casino project in Jeju. The Jeju Shinhwa World complex had its initial-phase “grand opening” in April, with the launch of a 344-unit serviced resort condominium called Somerset Jeju Shinhwa World. According to a last week report from South Korean news agency Yonhap, Landing International aims to open a first theme park at Jeju Shinhwa World on September 30. Landing International had announced last month an agreement with Hollywood media group Lionsgate to develop a theme park at Jeju Shinhwa World. Theme park construction is likely to start in 2018 and that facility is scheduled to open in 2019. The firm also announced in August plans to launch a Four Seasons-branded property – scheduled to open in 2019 – at the Jeju Shinhwa World complex. Questions have been raised however by investment analysts regarding the status of future investments by Chinese companies in overseas gaming projects. An announcement reported on August 18 from China’s State Council – the main administrative body of the People’s Republic of China – indicated that the overseas “gambling” sector would be on a “banned” list as far as Chinese investors were concerned.